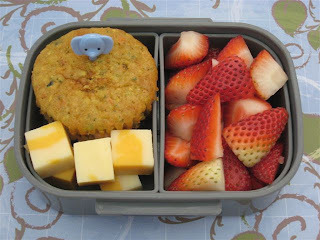 BentoLunch.net - What's for lunch at our house: Preschool Bento #43 - Zucchini & Carrot Muffins! Preschool Bento #43 - Zucchini & Carrot Muffins! Ben just has one day of school this week, so had to make sure it was yummy for him. He requested I buy zucchini the other day and I was wanting to make something other than his favorite cheesy zucchini appetizers. Hence, the muffins. They are zucchini & carrot muffins with raisins and homemade for my boy. For today's snack, Ben took one of the muffins, a few chunks of "Canadian" cheese for extra protein (Nana brought us a bunch and it is better than Texas grocery store cheese) and a bunch of freshly sliced strawberries. All gone when I put his bento box in the sink. Yummy snack, the muffins sound delish!